One thing I love about winter is how much more glamorous it is! Let me take you through what MandCo AW17 have in store. No weekend post this week I’m afraid. (This is far more interesting) I wanted to get this post out to you so you could see what MandCo have to offer this AW17. Anyway, let’s crack on with what I have to show you and I will leave links to some of the items that are available just in case you might fancy taking a closer look. These links do contain affiliate links, so I might earn a couple of pennies (and I mean pennies!) But it all helps and I can carry on working on this blog for you. However this isn’t a collaboration or sponsored post, I just love the brand! I hope you enjoy looking at what’s available and I’d love to know what your favourite items are. Puuurr I love the coat! How snuggly does it look? I also love the bead detailing on the jumper. This Faux Shearling Biker jacket is an item that I fell in love with. I love the colour and it’s available in Black too. I prefer this Oxblood colour myself. Imagine how warm this will be and great with jeans too. Or you could pair the jacket with these trousers for a smarter look. The jumper is cute too, although I would have to turn back those sleeves most of the time! I think this cute lace top could work day or night so I’ve added this beauty at the end of my daytime choices. MandCo has really gone to town this year on their evening wear. So many embellished items and sumptuous fabrics. Lots of Lace, Crepe, Chiffon, Devore, Faux Fur, and Velvet. There are even Velveteen Jeans for a smart/casual look. You name it, it’s available! Just look at the detailing on this beaded dress. I did feel the weight of it and it’s quite heavy as you would expect. Showstopper! There is so much lace with embroidery around this AW17 and this is one fantastic example. Now, I love MandCo for their accessories. I think it’s great value for money and if you’re going to buy anything for your AW17 wardrobe it’s got to be on trend accessories. All of the bags caught my eye and they look a lot more expensive than they actually are. We all know that any bag with a large ring on it is really on trend at the moment and my money’s on the Black and Tan bag at the left of this photo. I’m going to get this one for sure! It’s available now here I also like the chunky necklaces and the bag with the animal print strap, I think it’s a nice little extra touch. I liked these shoes, especially the pewter ones. Smart, with a low block heel. Perfect for women on their feet a lot. Some real statement jewellery items going on here! I was impressed with the boots. I like the cute tassel detail. I can’t leave you without featuring a bobble hat! The 5over50 challenge is about hats next month and I’m just wondering if I might get away with one of these? I think they are so cute! Some gorgeous chunky scarfs available too. That’s it. What do you think? I like a lot of it! Please do let me know which items you would choose. Have you started wearing the woollies yet? I’m sitting in something cosy as I write this. There will be a new post on Monday. I will be showing you one of my first AW17 outfits, so I hope you will join me. I love all of these clothes! It seems like they have a pretty wide variety of looks to choose from. I especially love all of the dresses you’ve included, because they are so feminine and chic. Also, that red coat is so fun! 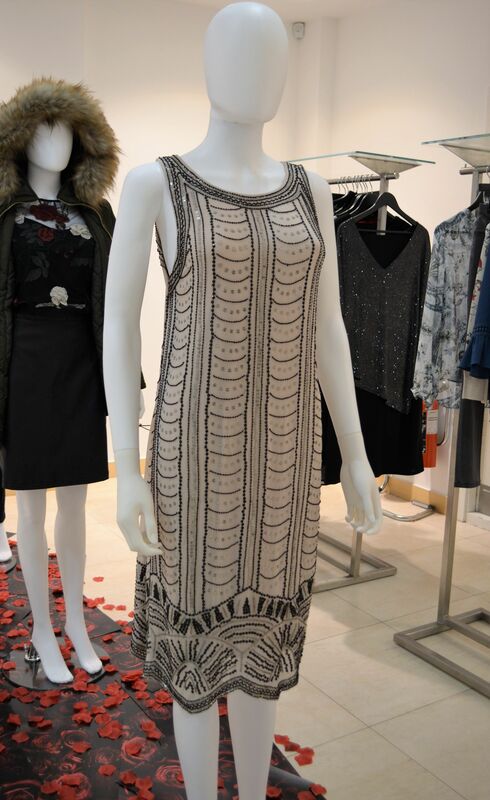 Love this line, particularly that 1920’s inspired beaded dress! So pretty. And the day wear is fabulous as well. Wow, so many lovely pieces! I love that plum print velvet Devore dress as well. The textured coats and of course the red pea coat is lovely too! I love a great statement coat. What a fun event as well. looks like you had a good time. Great post! Love all of the colorful outfits! The animal print fur coat was my favorite but there were so many other great looks as well. All of the details were fabulous and the variety of patterns made me smile. Thank you for sharing these style insights and for adding your post to my Fine-Whatever link up. So many gorgeous clothes! I love the oxblood jacket and trousers, and the accessories look fab too! This furry coat is amazing! Pity that I don’t have use for it in Singapore…. What a fabulous collection! I can honestly say I’d wear everything!! Of course, my wallet might be on fire then…ha ha! Laurie I’m loving that ‘a’ line skirt with the poppers I used to have one like that when I was 10! Beautiful pieces! I especially like the Faux Shearling Biker jacket. They have come along way. I’m liking the bags and the beaded jumper with snuggly coat very much. Fabulous colours. I actually like the day wear more! And I love tweed! My favourite is the red coat on the first picture. Stunning! I am sooo drawn to evening wear, which is a shame as I don’t have an evening life 😢. I can but look at these lovely things and dream!